Kai-Uwe and Hagen Denker presented an interesting paper at the November 2016 AGM of the Namibia Professional Hunters Association (NAPHA): Kudu population dynamics with special reference to the periodic outbreak of rabies amongst greater kudu in central Namibia. The authors suggested that kudu population dynamics (and densities) seem to be causal to the occasional rabies epizootic in Namibian kudu. They offer suggestions for discussion amongst the NAPHA membership regarding kudu-specific management practices as their specific contribution to long-term healthy kudu populations and balanced habitats in Namibia. In the presentation the authors discussed habitat requirements (habitat structure, utilization and over-utilization), and the interaction of habitat structure and kudu population densities as well as supplementary feeding. They also looked at kudu mortality factors (periodic disease outbreaks, droughts and predation, sustainable use), as well as herd rebuilding after catastrophic disease and/or drought impacts. Kai-Uwe and Hagen Denker used their personal experience based on intensive observations on the 10,500ha Farm Schlucht in the Erongo Mountains of Central Namibia. They concluded that due to the cryptic behavior of kudu, the numbers in individual discreet populations seem to be much higher than generally believed; underestimates of population numbers and densities for a given area are therefore rather the rule and not the exception. They suggested that this is not limited to their observation area in the Erongo Mountains, but can be assumed for the entire country. High population densities in combination with other environmental factors are ultimately the reason for catastrophic disease outbreaks. To minimize disease impact population densities must be adapted to habitat and environmental conditions. Vaccinations are expensive, require huge logistics and usually do not produce the required results. Hence, Kai-Uwe and Hagen Denker suggest more pro-active kudu management actions through sustainable use, in particular hunting. They suggest in particular higher off-take rates for female kudu in the young (up to two years of age) and old (over nine years) age groups. Similar harvest objectives should apply for kudu bulls. The off-take strategy should concentrate on young bulls (up to 3 years); and trophy bulls (over 11 years). In both cases – female and male kudu – this sustainable off-take occurs in age classes where natural mortality rate is usually highest anyhow and the hunting off-take is thus compensated. In other words, most animals in these female and male age classes would die anyhow due to factors other than hunting. The Denkers also suggest that non-trophy bulls in the age classes of 6 to 7 years, which show no promising horn development, should be harvested rigorously in order to reduce social stress in the bull herds. These suggestions offer high class, yet affordable, conservation hunting adventures for dedicated fair chase hunters and open a potential new market for NAPHA members. Finding and classifying kudu cows and bulls in the natural Namibian landscapes and selecting those which should be harvested according to the management plan requires as much or more skills than harvesting an elusive old bull. In the company of an experienced professional hunting guide and his trackers, such an adventure offers many rewards – from the exhilarating hunt to the scenic sunsets and sunrises, and the nights on the campfire and the hearty taste of a kudu steak grilled over the coals. 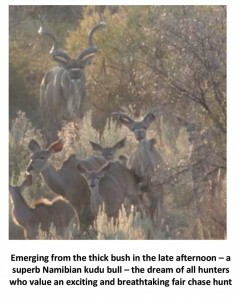 Old kudu bulls in the sixty inch range don’t grow on trees. They are the result of careful conservation actions of the stewards of the African wilderness. Therefore, hunting these bulls is naturally more expensive and time consuming; but it is one of the crowning African hunting adventures and a great reward for the hunter-conservationist. Of course these bulls can be bred selectively, from genetically tested superior parent animals within closed breeding camps where they are sheltered from the onslaught of environmental factors. But I suggest that such line-bred bulls are not what we hunters are looking for. The hunting of these gray ghosts of the African bush must not be allowed to degenerate into the killing of a semi-domesticated animal that happens to sport large horns. Big old kudu bulls have tickled the fantasy and imagination of many hunters from around the world, epitomized in the tales of authors such as Ernest Hemingway and Robert Ruark. In wild natural surroundings and unadulterated landscapes, big old bulls are the smallest segment of a given kudu population. The luck of the moment and the patience and will to wait for that magnificent bull to appear, apart from superb hunting skills, are decisive factors. The determination of the hunter to wait for another day or even another hunt, for a more favorable moment, is indispensable. Taking a big kudu bull on a hunt is the exceptional award for a real hunting adventure, and if you have the determination and patience, Namibia has all the conditions to make such a dream become reality.